As written in the forward in my other LED Lights Article. Likely, over time my biases will change, since LED lighting is a fast developing and changing aspect of aquarium keeping. Especially among those keeping reef and high tech planted aquariums. From brand patents/exclusive license agreements, drivers, dimming, input/output energy, and more, the science speaks for itself!! The repeated experiences back up the science! Lighting and aquariums ARE science, albeit with art and personal preferences mixed in! I try and mix simplified science for easy reading along with a lot of practical experience in this article. I cite many other related articles to back up the science and hopeful to make it easier for a overall easy learn of a very complex topic of aquatics. This information is backed up by experienced individuals, which I know well. If we can understand the overall aquarium LED fixture, we can make an informed decision on our aquarium LED purchases. Please read ALL my cited references and consider reading my other articles about Aquarium Lighting. They provides some foundation to the hows and whys of this article. This includes consulting with professionals, which also includes consulting for lights I have not used as well as the use of pictures to fairly display all lights reviewed. These pictures show that pretty much all the lights reviewed will get the job done in some form or another. I often make comparisons using one light in particular as a standard, but this does not mean the other lights do not work, far from it. But to not make provable comparisons using one light as a standard such as input wattage to output PUR would simply not make for an honest review. In the end, it is quite common in review to set up one product as a standard, such as using a Mercedes as a standard to compare other cars to. This does not mean a Mercedes is the car for everyone and that other cars do not work [of course this analogy may be poor in that I actually do not know what car might be the best one to set as a standard, but I am sure readers get the point!]. Whenever choosing an LED, make sure it’s known as to what is trying to be achieved, such as Reef, Freshwater Planted, Nano Reef, Deep Freshwater Planted, etc. 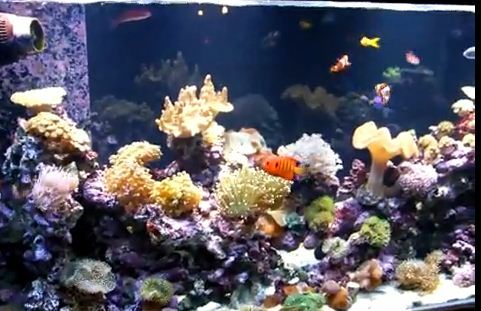 This Review will often include comparisons where they can be factually established as to input energy to PAR output for the simple reason that when LED aquarium lights first became a viable alternative for advanced planted and reef aquarims, the main reason to utilize LED was for their high efficiency compared to other lighting types. 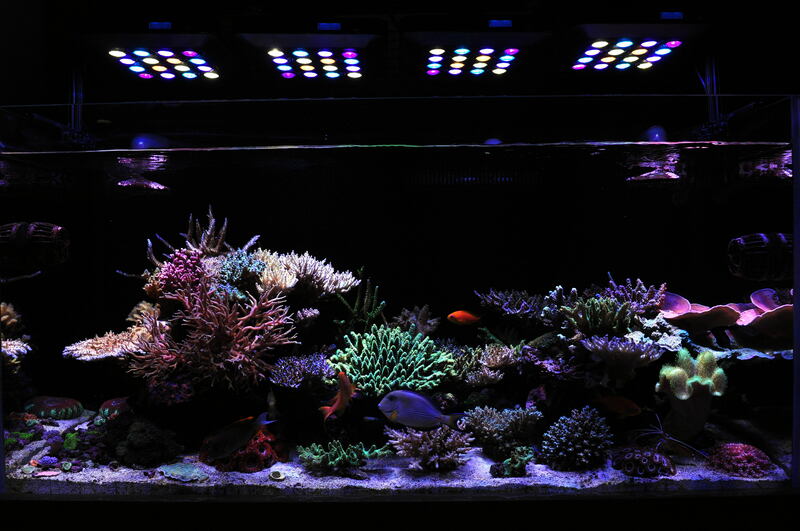 Unfortunately of late, while most all popular aquarium LED lights can keep Reef or Planted tanks as advertised, many come at vastly lower efficiencies, some even rivalling Metal Halides in energy usage, which in this authors opinion defeats the purpose of utilizng LEDs in the first place. This line of the Finnex is very similar to the Ray 2 models, but it does space out the emitters differently, which Finnex claims is idea for “refugium purposes as well as low-medium light needy aquariums”. This model does come with a moonlight switch. It also has a moisture resistant PC Splash Guard to protect against water mishaps. 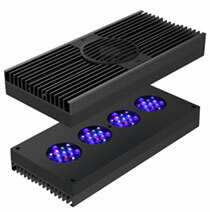 The Planted 24/7 version offers “true” 660nm red LEDs, unlike others using just “red” LEDs. Studies have found to be one of the most efficient wavelengths for plant photosynthesis. This also gives a warmer look to an aquarium. With this many emitters and a cost price point, these are clearly daisy chained together, which is OK for Christmas lights, but not high end LED fixtures. The result is loss of spectral quality (this is an undisputable fact too). Again using the 20 inch model, at 15 watts input energy its output in “useful light energy” is poor compared to better built, non daisy chained LED lights such as the AquaRay. With this 20″, 15 watt model Finnex, the PAR at 400mm of air tests at 40 µMol•m²•sec. This is .37 watt of input energy per mm of PAR. Again compare to the 12 watt GroBeam #600 @ 61 µMol•m²•sec for the same distance with a much higher PUR as well. This is .19 watt of input energy per mm of PAR. Similar comparisons could be made with other “high end” LEDs such as the BML, AI Hydra that do not daisy chain emitters and use better emitters to start with over the low cost, low output no name emitters used by Finnex. 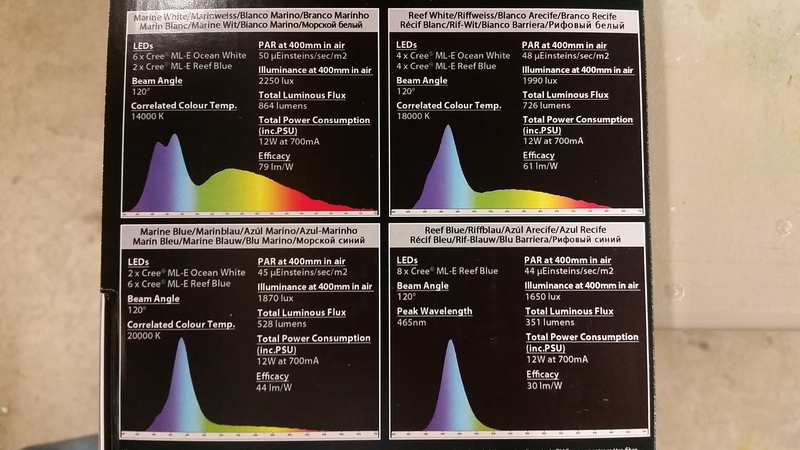 Taking this comparison a step further, since the “raw” PAR data suggests 1/3 lower PAR for the same size 20″ inch Finnex compared to the 20″ 12 watt GroBeam #600, we also need to add in the loss of spectral quality via daisy chaining and low efficiency low cost emitters compared to the licensed CREE emitters, and this 1/3 lower output easily becomes 50% or more. Based on the very poor warranty (180 days), lack of a good water resistance rating, and energy output efficiency, I can only recommend these lights for those seeking to save $20-$30 short term, this is assuming your planted aquarium could get by with less light from the Finnex and does not need two Finnex where one better LED would work). Long term savings will quickly evaporate on these Finnex lights based on lifespan and energy usage for results achieved since it can easily be assumed from known PAR & PUR data that it it would take twice the input wattage of Finnex to equal the PAR/PUR output of the AAP/TMC AquaRay GroBeam. The thing that sets this fixture apart from the rest of the Finnex line is the season cycle, along with coloration control. The fixture focuses on use visual and feature appeal. The features have good reviews. Growth is moderate. Since the fixture has these features, which require dimming, they must be using 0-10v dimming. This version of the Finnex comes in three different versions. There’s a daylight 7,000K, 10,000K, and 460nm marine actinic blue. These fixtures pride them self on a quality aluminum design, which helps heat escape from the emitter, through the fixture and out. One fixture, they compare to (3) T5 lamps. With a water slash guard type of len over all emitters. The lens can be removed for easy cleaning. The emitters are ceramic and not plastic. These fixtures are not designed to dim, without any option to do so. There are no features listed for the unit. The Fluval LEDs is a economy build that has evolved into a very nicely aesthetically designed line of LED aquarium lights. Fluval has added IP67 waterproofing, which few LEDs other than AquaRay have had. As well the warranty at 3 years is one of the better warranties, with only the AquaRay line beating this with 5 years. However, the Fluval still use multiple no-name low cost emitters that are daisy chained together, instead of fewer HO quality emitters run with appropriate drivers/circuitry such as the AI, AquaRay, and other premium LEDs. It is well known that it is not cost efficient to drive high numbers of emitters with proper voltage, so daisy chaining is used for LEDs such as the fluval, Satellite, & Finnex. This results in lower spectral quality (PUR) and lower efficiency which shows in the low PAR and PUR output per input wattage. As well dimming is analog, which also lowers spectral quality. An example would be the Fluval Fresh & Plant 2.0 A3990 which uses 32 watts of input energy with a PAR output about 70 µMol•m²•sec at 400mm. This is .45 watt of input energy per mm of PAR. However the 30 Watt AquaRay GroBeam 1500 produces a PAR of about 150 µMol•m²•sec at 400mm using 30 watts input energy. This is .20 watt of input energy per mm of PAR!! This does not even take into consideration the higher sprectral quality of tuned specific licensed Cree emitters controlled by PWM versus analog dimming. Another way to think about it. The 32 watt Planted Fluval 2.0 rates about 70 µMol•m²•sec at 400mm for $135, where the AquaRay GroBeam 12 watt rates about 61 µMol•m²•sec at 400mm for $123. So, watt per dollar, you get a better value with the AquaRay, with less watts about the same PAR, all with the other perks of a patented solid build and a 5 year warranty. This doesn’t even take in account PUR and the amount of emitters used in each fixture, which if is taken into account, the AquaRay GroBeam would have more useful energy and cost less, with a more secure build. 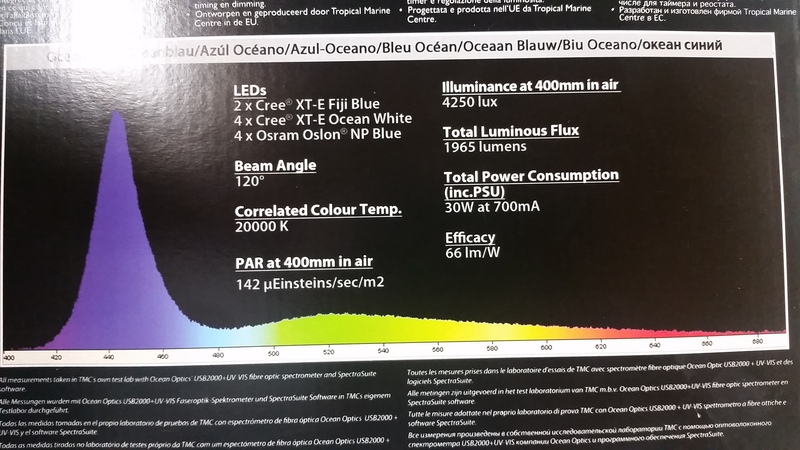 Fluval also claims “high CRI” however we already know that this is not a parameter to consider for aquarium lighting and is a marketing strategy often employed by lights with less than adequate PUR since CRI is easy to achieve. So it is easy to see that while a nice sleek fixture, the Fluval is still at heart a basic economy LED masquerading as a quality HO LED! Maxspect Razor, TMC V2 iLumenAir, are all based on the same general basic build as the Zetlight Qmaven. Made in Honk Kong. Zetlight reserves some of its technology ONLY for their name brand line and iLumenAir such as the smart fan and better emitters. Zetlight also has other LED models, not reviewed in this article at this time. (Mini Aquarium Series, Nano Aquarium Series, Aqua Aquarium Series, Pro Aquarium Series, Project Aquarium Series, IOZEAN Aquarium Series, Lancia Aquarium Series, and Shieldo Aquarium Series). The use of cooling fans implies that the Zetlight Qmaven, Maxspect R420R, & TMC V2 iLumenAir all use 0-10V “Current Reduction” versus the superior PWM to control the emitters. The negatives again are the LACK of energy conserving, light efficient PWM controller technology, less than desirable PUR due to the many colored LEDs, and less than optimum PUR efficient emitters. Part of the problem is the use of warm white and cool white emitters, such as the Cree XPG 3000k warm white, which is not an emitter best used for aquatic applications. The Maxspect has the least amount of features compaired to the others. This said, these are nice LED fixtures for those desiring a good light for coloration of their reef specimens where an efficient lower wattage per PUR/PAS fixture is not important. These are clearly not the best as per the known science of aquarium lighting, but are certainly reef capable at albeit a higher cost of operation (and higher carbon footprint), as well as shorter useful product lifespan. 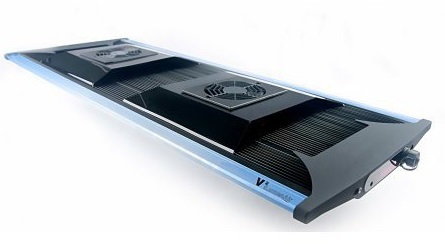 Designed to be primarily cooled passively, the body is entirely in aluminum, serving as a large heat sink. With the aerodynamic design, cool air is brought through the bottom of the fixture and heat will be dissipated through the aluminum chassis. With a built-in temperature controlled system, with active cooling. The use of cooling fans implies that the Maxspect Mazarra use 0-10V “Current Reduction” versus the superior PWM to control the emitters. 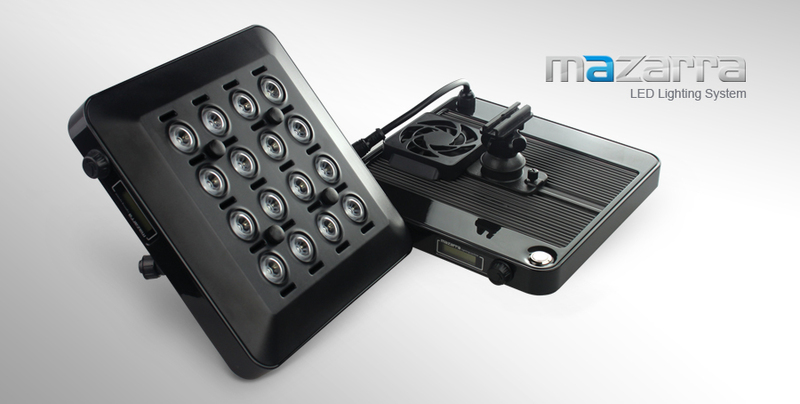 The Maxspect Mazarra lighting system is one the first LED systems on the market to utilize the 410/420nm Super Actinic LED chips (violet). 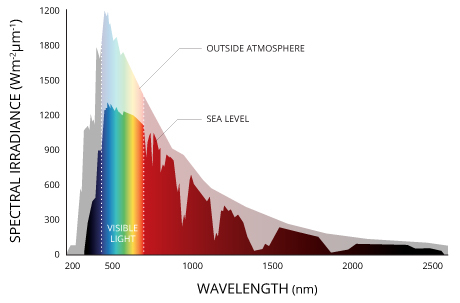 Maxspect claims this spectrum is crucial for the success of any reef and water plant aquariums as it is required by Chlorophyll A for photosynthesis, where absorption peaks at 412nm. While this claim is not fully substantiated, there is evidence that SOME corals need this spectrum for proper growth. However, little evidence exists that this spectrum is needed for freshwater aquarium plant growth. Other fixtures do have this color of emitter as well. The spectrogram is missing some important points of PUR and full spectrum PAR. Not to say this is not a good spectrogram, only that it could be better. The Mazarra-X Lighting system can be connected to PC through USB, allowing users to update firmware easily through the USB connection. Upcoming Maxspect Computer Control program will also allow users to program photo-period profile directly from the PC and upload the profile onto the master module. The AAP/TMC AquaRay is one of the leaders in both Reef and Planted freshwater aquarium LED lighting [especially in Europe], with 11 different module fixtures to mix and match depending on species being kept and aquarium specification. 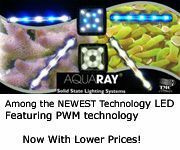 Their PAR/PUR efficiency and warranty is unrivaled which is why in part, I use the AquaRay as the standard to measure all other aquarium LED lights by, despite the mass marketing of many others that has allowed many others to become more household names. Emitters are fully licensed or patented, meaning no other fixtures have these emitters. They also have an exceptional 5 year warranty to back them up, which is far longer than most all other aquarium LEDs. 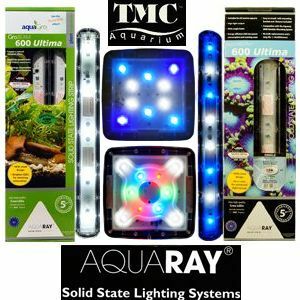 Another aspect I like about the TMC AquaRay line of LED lights is their patented mounting system that is like not other LED with vastly more mounting options than any other aquarium LED light, advanced or economy. The licensed Cree and patented innovative Osram Oslon emitters, which no other fixtures have for the highest PUR output at the lowest watts. Instead of warm white or cool white emitters, the AAP AquaBeam/AquaGro LEDs use more reef or planted freshwater friendly kelvin temperature emitters. These emitters are also aquarium specific meaning they are meant to be used in a more wet environment and can handle larger voltage swings, due to long term exposure to moisture. In fact, the AquaRay LEDs have a water resistant design of IP67. 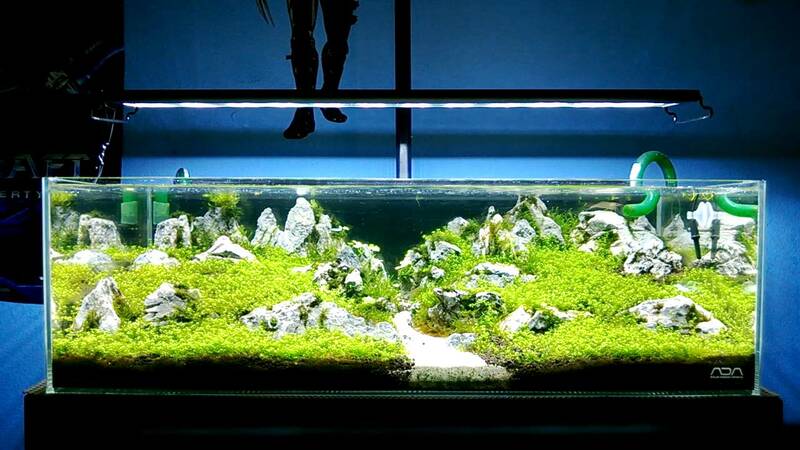 This is the highest level of protection, no other Aquarium LED has this rating. TMC uses precise drivers/circuitry to power each emitter, so as to maintain spectral quality. Unlike other LEDs, which daisy chain their emitters together. Almost like chaining Christmas lights together. Other good/excellent “High End” LEDs such as Aqua Illuminations, EcoTech, V2 iLumenAir/Maxspect, and Kessil do not daisy chain their emitters either. 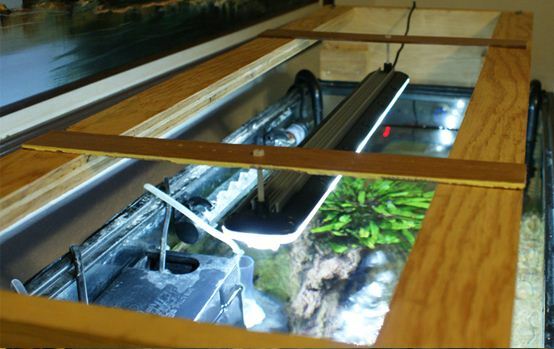 The AquaRay line of LEDs ARE THE MOST EFFICIENT aquarium LED as per input energy to PAR using 400m as a measurement. This is worthy of note that even leaving out the longevity, warranty, and highest PUR, the simple measurement of PAR shows that where two or more of one fixture might be needed, only one Aquaray might be needed. The watt per micro-mol of PAR ranges from .08 watt to .20 watt per mm of PAR for Aquaray LED fixtures. Other LEDs such as the Beamworks are as high as 2.7 watts per mm of PAR! Beware of posers selling this product with names that imply official and experience, as neither is true. The above link is the ONLY North American online seller with a decade of experience selling this product and decades of professional lighting experience behind it. In fact in investigating further, I found that a certain parasite garage retailer now has two deceptive web sites shadowing each other selling the Aquaray and unfortunately Google Search rewards this “black hat” SEO with top billing! Do not make the mistake of purchasing from a garage seller! 4 x NP (Nature Perfect) Osram Oslon full spectrum Blue -Focused Lens. (18,000k) with a correlated color temperature of 20,000K. 4 x NP (Nature Perfect) Osram Oslon full spectrum Blue. (18,000k) with a correlated color temperature of 20,000K. 2 x NP (Nature Perfect) Osram Oslon full spectrum Blue. (18,000k) with a correlated color temperature of 20,000K. A 75 gallon planted with two GroBeam earlier generation LED tiles is pictured to the left. 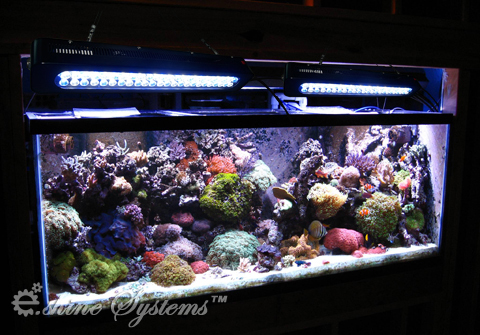 Below is snip of a large reef aquarium utilizing AquaBeam Reef White 2000s & Ocean Blue 1500s. NOTE: designed for small Nano Reef Tanks under 15 gallons, although multiples work quite well for larger aquariums where the “square” light spread might be desirable over multiple strips (the picture displays this light with a “MountaRay” bracket for easy attachment to small tanks). The Mini 400 uses four new high output OSRAM OSLON SSL High Power 6500K LED Emitters. The AquaRay LEDs apply latest technology to controllers, which dim and brighten an LED fixture. As a controller best maintains the spectral output via pulse width modulation (PWM). The importance of PWM is this technology is effectively turning the LEDs on and off very quickly (faster than the eye can see) so there’s no change to the spectral output as opposed to using 0-10v dimmer used by many brands of LED fixtures and LED Controllers. This is what really sets the TMC AquaRay apart from others, since there’s little heat loss with PWM compared to other methods. This is also for long-term security of the emitters, as over time with a moist environment, spectrums and emitters can start to degrade. The AAP AquaRays do not have fans, which is a large plus considering the life of the fan will never last as long as the emitters are rated for. With less heat, these means more energy is being used as light and less watts of energy are being used. This also helps makes the fixture completely IP67 waterproof. Probably the only downside to this technology is the complexity of the circuitry and it does come with a price. A separate controller is needed. AquaRay chooses to keep their dimmer separate, as not everyone needs it and the fixtures can simply be raised and lowered or a good grounded timer can also be used [which is what most persons used until LEDs became practical]. A higher pitch sound also has been reported with PWM dimming, but is something not noticeable unless someone is specifically listening for it and can’t hear it over other sounds of the aquarium. It is also worthy of note that other Aquarium LEDs use fans, which make their own noise and often breakdown prematurely, so this is a draw here. 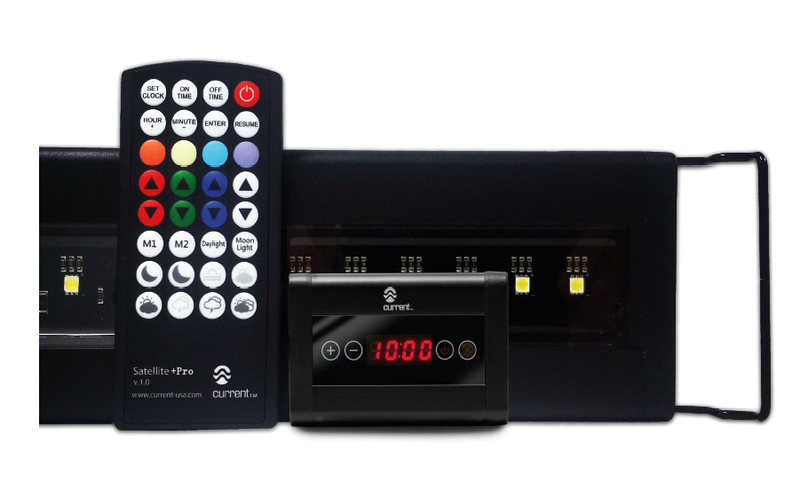 Other complaints are that the TMC controllers are not as user friendly, although their new Smart Controller 8 with new features certainly voids this issue, at least in part. Now the new controller has more user features not even found with other common fixtures. Either way the use of PWM and lower heat loss resulting in more light overrides these issues in my experience/opinion as well as with interviews with aquarium keeping professionals. The result of these industry leading technologies as well as not going with the gimmicky, yet popular multiple color emitters such as green/yellow/orange emitters [with the exception of the Colour Plus], these TMC AquaBeam & AquaGro GroBeam have the highest PUR output for the lowest wattage input, often by a very wide margin. The excellent TMC 1000 Ultra has been replaced as of August of 2013 with the AquaBeam 2000 NP Ultima. The new 1500 & 2000 LED combines the exclusive and licensed Cree 10000K XT-E daylight emitters with the high output XT-E Fiji Blue. 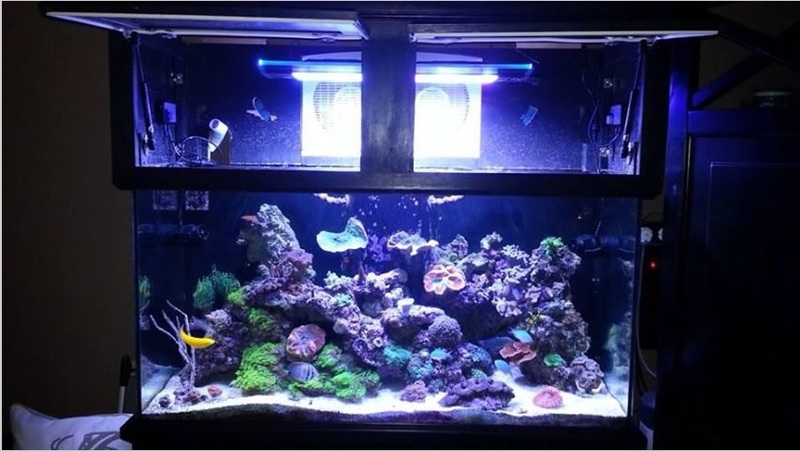 Even more impressive is the TMC Ocean Blue NP 1500 & Reef White NP 2000 includes the patented innovative NP Blue Osram Oslon emitter which is specifically designed for photosynthetic reef life, providing a blue light, which still is full spectrum. It provides the growing power of 20K, while having a 16K appearance. This is a higher level tech emitter, not available in any other aquarium fixture. As well these TMC fixtures, continue to use advanced driver technology, which does not waste nearly as much heat energy as other comparable LED fixtures. Instead, much more energy goes to actually lighting your aquarium. The TMC Ocean Blue NP 1500 is an excellent choice for aquarium keepers with tanks under 22 inches of depth desiring a very high output blue and daylight light combinations from a small footprint yet high output (high PUR) aquarium LED. This is not a depth penetrating LED fixture despite its plethora of excellent blue emitters, this is due to the fact it is not focused unlike the TMC Reef White NP 2000. However these two fixtures can be combined 1 to 1 for tanks with 24-32 inches of water depth. NP 1500 has a much larger area of light output from the same small foot print of the 2000 tiles. The NP 1500 with a beam angle of 120 degrees has a 24 x 24 inch light spread, with fixture at optimum 8-12 inches above tank. While the light spread is about 18 x 18 for the 2000 Ultimas, which have a 60 degree beam angle. It is also noteworthy, the combined emitters used in the NP 1500 have a higher PUR in proportion to the testable PAR (PUR is the actual useful light energy). The 2000 tiles are still the most focused best depth penetrating (albeit with the lowest light spread) of all TMC AquaRay lights and quite bluntly MOST any other aquarium LED but for the Orphek & Kessil! This makes the AquaBeam 2000 LEDs the best choice (as per TMC products) for tanks over 20-24″ in depth including deeper hexagon or similar reef aquariums. 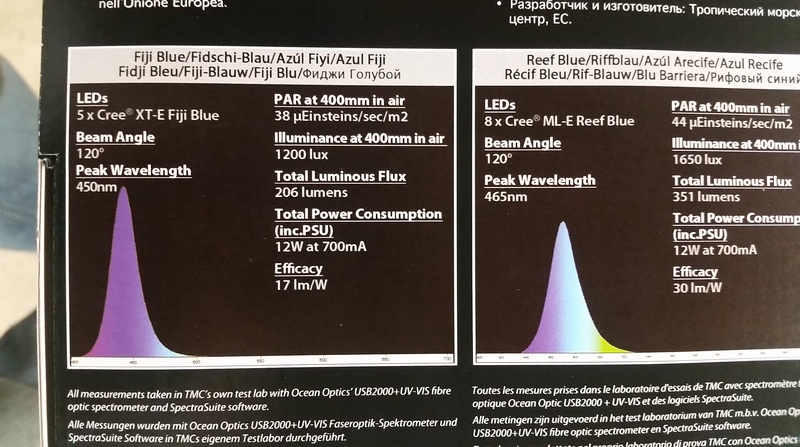 As noted earlier with the 1500 NP Ocean Blue, this LED uses the exact same emitters, but with lenses producing a much smaller 60 degree cone of light with much more depth penetration. The TMC 600 models are excellent as stand alone LED fixtures or as compliments to the 2000 and even 1500 models so as to add light spread in larger deep tanks. TMC also now utilizes the newest licensed XT-E Deep Blue 450nm un-lensed emitters in their AquaBeam Fiji Blue Fixture (pictured above), which is an excellent compliment to the Marine White or even the AquaBeam Reef Blue for a very nice full blue spectrum, specifically for enhancing the fluorecence of corals. Notwithstanding, the EcoTech Radion does a nice job here too mixing blues. While I personally have found this an excellent new offering from TMC the moonlight mode somewhat a gimmick based on known facts about moon light and its affect on corals, etc. However, TMC is simply bowing to customer demands here. Also see LED Aquarium Lights & Lighting for further LED information and as well for further information about the TMC AquaBeam 600 and 1000 Ultras. TMC had a failure of their quality control for the Ocean White 1500 in that CRee sent cool white emitters (those used by EcoExotic at the time) instead of the patented 9000-10000k XP-G emitters. These were installed in a few runs in the spring of 2012. It is noteworthy, this mistake was caught by a couple of customers with a good knowledge of what a quality LED should produce in light energy and they noticed the difference from other TMC LEDs since these non licensed Cree cool white binned emitters used by most other LED manufacturers produce a more yellow, lower quality PUR light.. Here is an excellent newer website documenting the LED research at Saint Mary’s College of Maryland by Dr. Walter Hatch, THIS IS A MUST READ! These products are primarily decorative and are mostly useless for lighting an aquarium as per the necessary light energy, especially needed by freshwater plants or symbiotic zooanthellic algae found in many corals, clams, & nudibranchs. That said, TMC is not marketing this product for anything other than minor supplemental or decorative lighting. As an example, the Flexi-Red only provides subtle highlights of red (which might be great for some freshwater tetras, discus, etc. ), however at night by itself this Flexi Red LED does add an interesting effect in the aquarium. 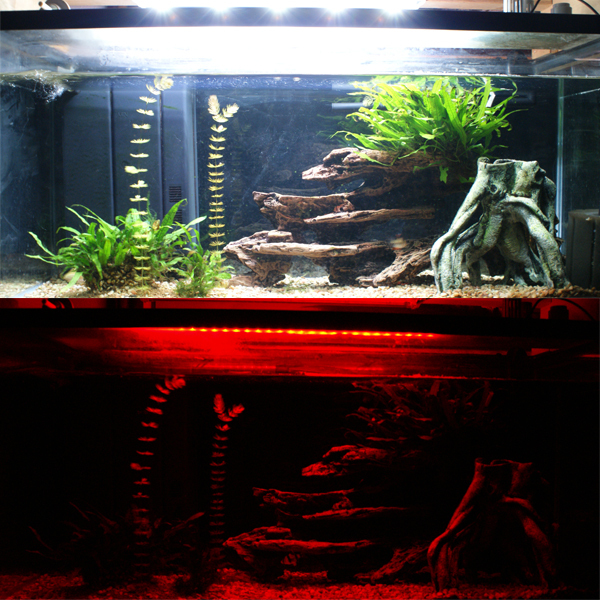 The Flexi-Red Strips are excellent for use with nocturnal fish such as Blennies, as many nocturnal fish are active with low level red lighting present in their aquarium. 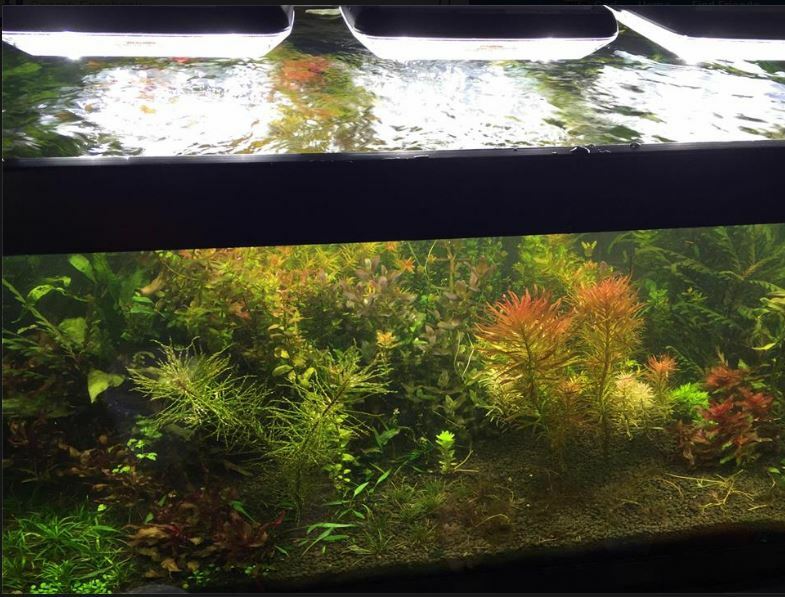 As well as a supplemental light, the Flexi-Red can be added to planted aquariums to add a small amount of additional near-infrared red light energy for plants such as Rotala. The blue strips are excellent for use as a moon light for those who prefer a blue color for night lighting, notwithstanding that moon light is not actually blue, but this is the color most persons seem to prefer regardless. The TrueLumen by Current USA is similar, however it is unfortunately marketed by many as a main light source, while as with the TMC Flexi-Red the TrueLumen is only for supplementation. 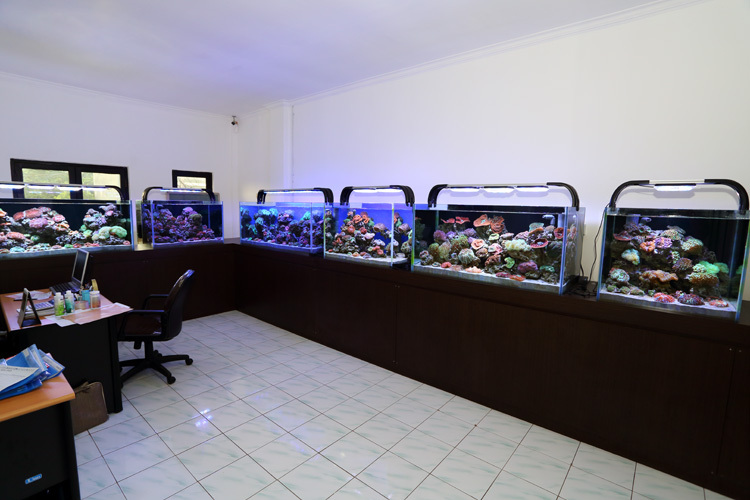 The Kelvin Color temperatures (other than the Rose, Rose/White) are primarily for marine aquarium supplementation. Both these products are nice ideas when properly used with the TMC available in 18 inch strips and the TrueLumen available in 10 inch strips. Both are very easy to install with the TrueLumen available in more varieties while the TMC is a better value (due to a considerably longer strips for only a marginal amount of $ more). This is a new offering by TMC that is made to TMC specification in China with 6500k White Samsung LED emitters instead of the patented Cree & Osram Olson Emitters supplied with their premium AquaBeam and GroBeam line of LED Lights. Update: The AquaBar has been taken off the aquarium LED market. The Aqua Illumination SOL Aquarium LEDs use good quality, albeit older generation Cree XP-G 6500K and blue/royal blue XP-E series LEDs (AI does NOT have the license “rights” to the latest CRee emitters). The lenses and over all design is top notch. The driver/circuitry is well designed as there is less heat generating heat spikes than some other LEDs using Current Reduction. These LED fixtures are marketed more on features, rather the important: Useful Light Energy (PUR), NOT PAR only as some reviews may claim. Please reference: Aquarium Lighting- Useful Light Energy, PUR. This said, the AI Sol LEDs have interesting and admittedly cool features include proprietary 40 and 70 degree lenses and feature rich controllers that do an excellent job of getting light where it is needed. 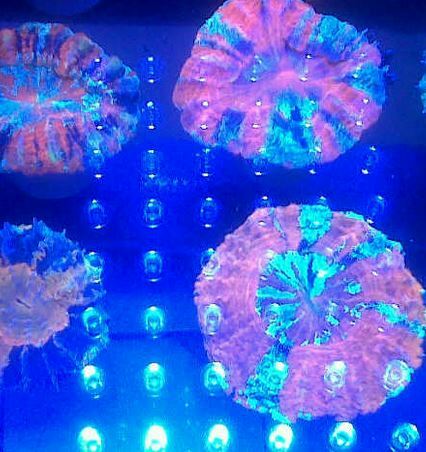 The Aqua Illuminations LEDs are capable LED lights for many light reef applications with many reporting reasonable results. This LED is essentially an older version 6500K planted freshwater light with good saltwater depth penetration of maybe 12″, combined with an excellent, but older binned (non patented) version XP-E blue CRee emitters, which are good for aquarium applications under 20 inches. Not for deeper tanks as many unaware reef keeper have used these LED fixtures for. 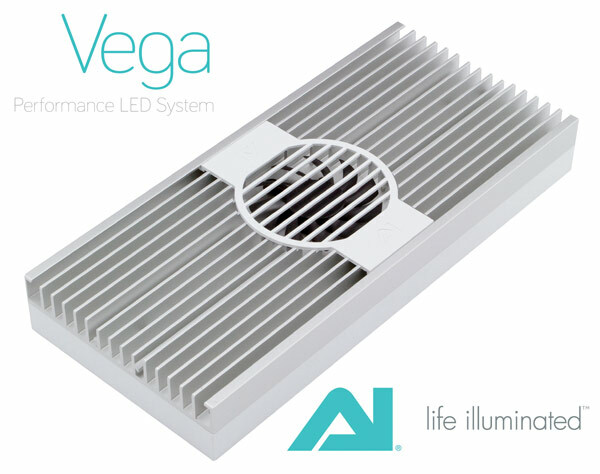 While the Aqua Illumination SOL is a good and capable LED light for many reef aquariums, at the price charged for this LED light fixture, there’s little reason to pay more, use more electricity, and get less. Known facts about the emitters used in the AI Sol, this is still a good choice for reef tanks under 20 inches of depth. This fixture has been discounted by the manufacture. This is a really clever & unique concept as per the controller. One of the most innovative controllers that is chock full of features, including the future “Director”! The obvious negatives is that while this is an LED light fixture, which is feature rich with lots of bells & whistles, it still lacks where it counts in Useful Light Energy! 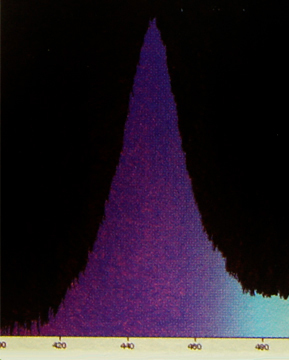 Note that while this is one of the better spectrographs demonstrating PUR compared to many aquarium LED fixtures offerings, which is why this is one of the better LED fixtures, one has to question the use of the generic cool white emitters, which can be shown to have more wasted light energy in the middle spectrum as well as the use of less efficient green emitters. This equals as much as 30% of wattage input goes as light energy OUTSIDE of optimum PUR!!! This fixture has be discounted from the manufacture. This is one of Aqua Illuminations newer offerings. A nicely made and excellent “high end” LED fixture that steps up from previous offerings with this 90 & 135 Watt LED Fixture. This Hydra Fifty-Two and TwentySix new HD has a very eye pleasing color balance, which along their sleek design and balanced 80 degree optics with 90% optical efficiency are their main selling points. This includes the Osram Oslon Deep Red emitters which do a nice job balancing the many blue emitters. Nice FULL feature light color control, quoting Aqua Illuminations: “With traditional LED lighting, there is a fixed total amount of power per color you can utilize to power your LEDs. With the Hydra HD Series from AI we’re unleashing your LEDs’ full potential by giving back control of the power to you”. The Hydra HDs have built-in WiFi control with AiFi Technology with no separate controller needed. Your Smart Phone iOS, Android, or computer browser control functions – Each press will change the intensity by 20%. This feature is both a positive and negative depending upon your point of view, as this is definitely not a plug and play LED, as you need to sync your wireless computer or Smart phone before you can even run the light at all, however many might find this feature very practical [I personally prefer a separate controller such as with the iLumenAir/ZetLight or one that can ALSO be synced with your computer/Smart Phone such as the TMC AquaRay]. These new HD Hydras can be run up to 90 watts for the Twenty-Six (135 watts for the Fifty-Two). With the HD Hydras, you can turn down one color and hydper drive another at more than 100% up to the maximum wattage. As a comparison, the iLumenAir/ZetLight/Maxspect when turned down on a certain color, these cannot be brought up in another color over 100%. As an example, some of the blues can be turned down and then run more of the red colors for a planted freshwater aquarium at more than 100%. The compact size is also very nice at only 7.28 in. by 5.375 in. for the Twenty-Six HD. This can allow for placing of many of the Twenty-Six HDs [my preference over the Fifty-Two] in a small space which is a major plus for those who like to over drive their planted or reef aquarium. The wireless controlling features are also nice, although lacking of more efficient heat loss reducing PWM, hence the need for a fan. 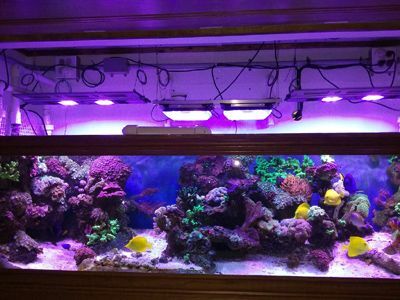 These LED fixtures still use “binned” Cree XP-G2 Cool White LED emitters, which is inferior aquarium lighting PUR/PAS, as it has lower kelvin color temperature rating than is considered best for marine reef lighting. The LED uses green emitters, which while these are nice for color, these also considerably lower the important PUR & PAS output. I also question the use of 400 nm emitters as while these may look nice, I do know from others use of UVA lights, that some burning of corals has occurred (No evidence that this will occur with these LED lights). There is little evidence these 400nm emitters provide much if any useful PAS to corals. The new unique “Hyper Drive” feature that uses software to over drive emitters with left over voltage from emitters “turned down” is something that over time will damage emitters as per the known aspects of voltage tolerances within emitters; hence the one year warranty. So while a very cool/desirable feature, this feature also has its definite down side. The Hydra HD are not really “Plug & Play” from the aspect that no real mounting hardware is included. So you either have to DIY in mounting or buy extra parts [actually DIY mounting is not that difficult for this fixture if reasonably handy]. When all is considered, including price, the AI Hydra HDs definitely rank among the best of the high-end aquarium LED fixtures and for those who might want to over-drive their planted or reef aquarium, this would probably be my first choice of any current LED fixture. However for most high end users desiring more “normal” reef or planted aquariums, but desiring what I would still consider more gimmicky feature of driving specific colored emitters at different levels, the iLumenAir/ZetLight would be my choice [the iLumenAir/ZetLight is also is much more of a plug and play fixture and includes very practical mounting hardware]. 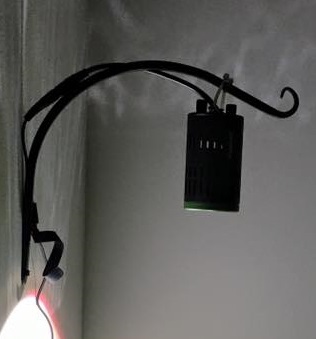 For those who want a simple proven, pre-tuned LED, with high PUR and output light for input energy, PWM, the longest warranty including more specific pre-tuned light choices; whether it be for their fish, high light planted or reef aquarium that includes some basic mounting hardware, my choice is the AAP AquaRay Lighting line. The Aqua Illuminations TwentySix is similar to the FiftySix except with half of the same emitters. Newest in the AI line up. A “one fixture to rule them all”. Coming in at 50 watts, with some nice user features like the newest wi-fi controller. Color control for appearance of one’s choosing. The wireless controller does imply 0-10v dimming along will more color emitters added up to make the overall spectrum. The Current Satellite Freshwater LED is a relatively new LED sold primarily at discounters such as Amazon or Petco and is quite frankly typical of LED lights sold at discounters in, which it is full of features that appeal to those with little knowledge of aquarium lighting, but are easily marketed to by “bells & whistles”. The fact these lights get good reviews on Amazon is why consumer reviews such as these are not to be relied upon. I will use the model #4007 as an example for this review. 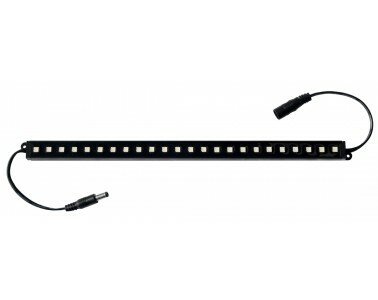 This LED is designed for 36”-48” aquariums and uses 25 watts of electricity. The LED emitters consist of 72 White & 36 RGB (Red, Green, & Blue) emitters. First the good, this truly is a feature rich freshwater aquarium LED, with a nicely laid out controller. Into the science of lighting, we see that this light achieves its 6500 Kelvin with no-name emitters. Not even known quality off the shelf Bridgelux or similar, which at least reasonable quality LED fixtures utilize. To balance out the 25 watts between 108 emitters takes at least a reasonable driver circuitry, which this LED does not do since the emitters are clearly daisy chained together as one would do with Christmas lights. This is in part why the energy output in PAR is so low per wattage input, as compared to non discount LEDs. The result is uneven voltage which affects the quality of the light spectrum as well as the life of the emitters, hence the poor one year warranty. 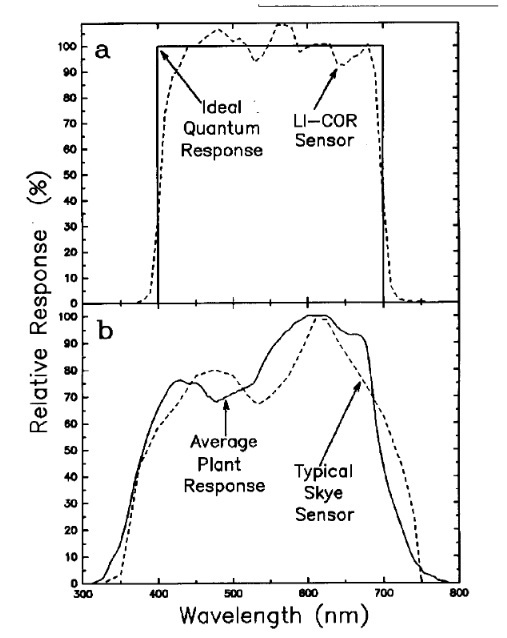 Green emitters are used for coloration, but are less useful as per photosynthetic life. The un-balanaced blue emitters can also lead to increased algae growth, in particular black beard algae if there’s an off balance of co2. This is a common problem with many of these low end LED lights marketed for freshwater aquarium keepers by discounters such as PetCo and Amazon. Now let’s look at typical cost when compared to a couple other freshwater capable LEDs. At about $105 for the model #4007 you get an LED, which uses 25 watts and can light an aquarium comparable to a 40 watt T8 aquarium light. This would be reasonable lighting for fish, but far from the best too. More importantly this would NOT be the best light for high light requiring plant growth or to fend off algae. My point is this is a well marketed LED that unfortunately is promoted in aquarium keeping forums that should know better, which should be avoided if quality and long life of the fixture are at all important to you. These only have an IP65 water resistance rating, which is terrible for an electronic device that is to be laced over water. Just based on warranty alone, the end price will actually be higher than a better PUR light quality LED, so your value goes right out the window! But even up front costs are actually higher when comparing apples to apples, as you would need more than one #4007 25 Watt Satellite that produces 25 PAR to achieve the same results as a AAP GroBeam 12 watt that produces 61 PAR at a similar depth, so in the end the Satellite is not even a good up front value for planted aquarium keepers!! The popular “Ecoxotic Stunner” is simply for additional lighting, not Reef or planted freshwater aquarium lighting. The LEDs are not of the output, wattage, or even the same generation technology as the LEDs used by other tech. As well the PAR output generally is below the necessary PAR required for photosynthesis. Now a days, with new higher PUR tech, something like 20 mmol of PAR is all that is required for photosynthesis. This is with more useful energy in the PAR spectrum (PUR), not just any mmol throughout the whole PAR. Ecoxotic Panorama Strips have 12 older technology 1 watt emitters (vs. the 2.4 watt high PUR emitters used in other fixtures). More emitters are required due the lack of precision (useful energy output, etc). That said, while the Ecoxotic Panorama Strips are not top level technology, these are still a big improvement on the “Stunner” and can be considered for Reef Tanks. A popular model is the Panorama Module 8000K/453nm Actinic Blue, which consists of 8 white lights and 4 blue lights. The newer Ecoxotic Panorama Retro 36 is closer to the higher end LEDs, even then the emitters are still not of the high output useful light energy bins. Worse is Ecoxotic’s approach to patents for the emitters they are using is “go ahead and sue me”, not the kind of company I think any honest person should support. There’s a reason that the better LEDs are priced as they are. It’s licensing. The over hyped Marineland Double Bright LED lights from Marineland are also purely for highlighting fish only or complimenting other lights. As with the Ecoxotic Stunner, these are much older “cheap” technology LED emitters of 1 watt each that do not come close in lumen, focused lumen and PAR output as the newer technology LEDs. 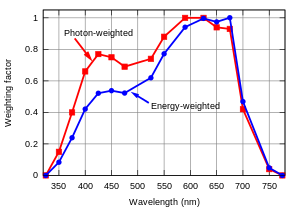 The so-called “Reef Capable” LED’s by Marineland, albeit much better than the Double or Single Bright, are still 2 generations behind the emitters used by the other newer generation lights, which utilize the best emitters, the best drivers, and PWM technology. These Marineland LED’s have a PAR reading, with the newer Apogee PAR meter, above 80 umol at a distance of 18 inches, but this is not the full story. Since it’s useful light energy (PUR), which is MOST important and this Marine “Reef Capable” LED with its 21 inferior one watt emitters is severely lacking here. 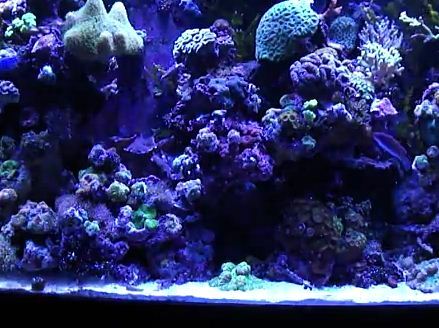 While the “Reef Capable” are what they say they are in being capable of keeping some photosynthetic reef life, their 21 one watt emitters (on the 18-24″ model) are not of the best PUR available in the better newest generation emitters and yet the Marineland “Reef Capable” are about the same price as the vastly superior LEDs. In fact, using 30 watts of input energy of high output emitters will well out produce the largest Marineland Reef Capable with its 54 one watt low PUR emitters. 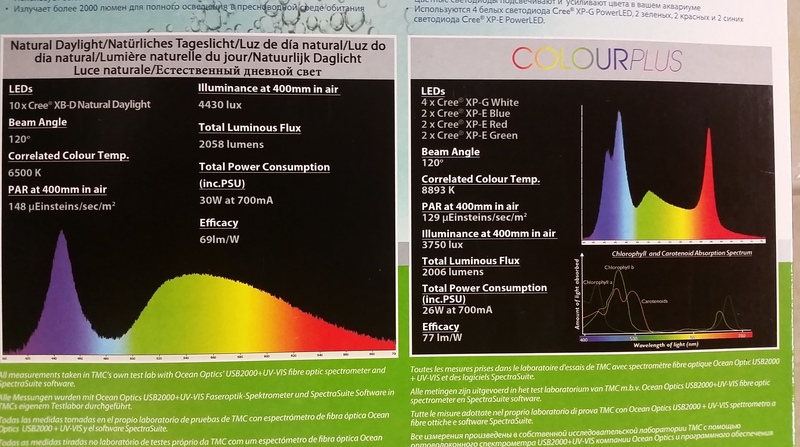 See the picture/graph below, while the spectrum of the light is decent for what we know of PUR, the clear way the LED is driven with low watts emitters does not allow for the extra punch in growth, with the extra intensity of higher driven emitters. There’s not much information published of the LED, but most likely has about a 12K rating. No information on emitters or drivers used. *As another update to the Marineland Double and Single Bright LEDs, I met with one of my aquarium maintenance colleagues and discussed the results further and re-examined this LED light in action. After further examining of the low PAR output Chinese emitters used by Marineland as well getting further expert input that these lights are at best for fish only tanks. 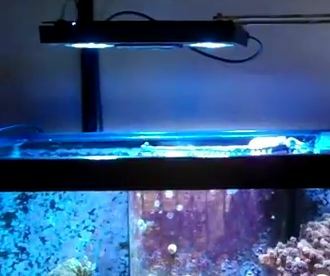 Basically, the Marine Single Bright had no more output than an 18″ 15 watt T8 Fluorescent aquarium light and should be sold/purchased as such! 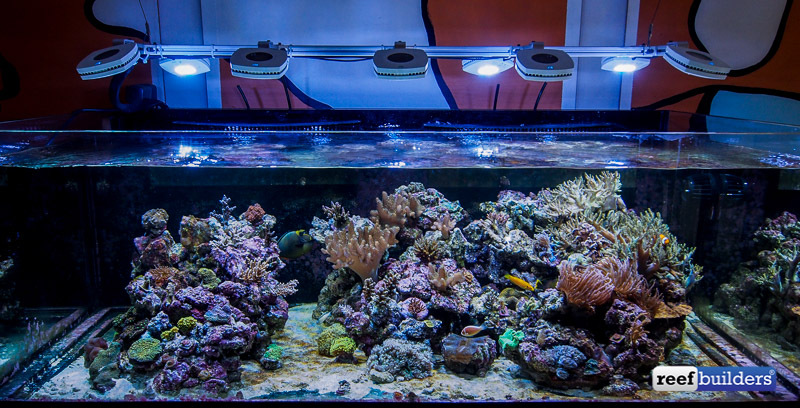 In summary, the Marineland LEDs, whether the Single or Double Bright highlight LEDs or the better “Reef Capable” LEDs are still vastly inferior LEDs sold primarily at only often questionable mass merchandisers such as Pet Mountain. This is another Asian import along with the TaoTronics (same manufacturer in China), which utilizes older technology in quantity to make up for what it lacks in new emitter technology quality. 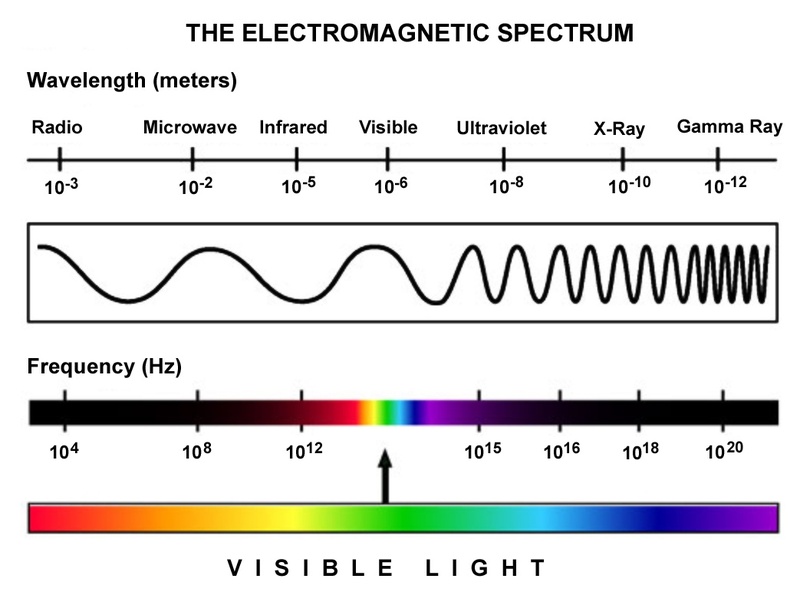 As you can see with the picture/diagram below, this LED light is much to heavily weighted in the blue spectrum of light for an accurate PUR (Useful Light Energy). I would only recommend these LED fixtures as a compliment to 6500K to 10,000K light and even then if you get a great deal, otherwise for 1/3 the wattage you have a much better LED light in better technology. The other problem with these two LED Fixtures is the more emitters, the more complex and expensive the drivers, so when you have a fixture such as this TaoTronics or Blue Moon LED with a shotgun approach of emitters yet with essentially no drivers you are essentially stringing hardware store quality LEDs together over your aquarium. A similar Chinese LED to the Blue Moon and Taotronics, these are another economy LED fixture all made in the same Chinese factory. These are all reef/planted aquarium capable via a higher energy shotgun approach to LED emitters & daisy chained drivers. All three of these LED fixtures are made in China by Chinse company that specializes in branding. Meaning a seller can customize and then re-brand the fixture to fit their marketing niche. However the guts and concepts are all the same; these are all still lower end low cost LED fixtures that will grow plants & coral well, but are also as much as 1/4 the efficiency of better LED fixtures that better utilize PUR, emitters, drivers and more. The end result is a most definitely capable LED fixture in the basic as well as customized versions, often with very nice coloration, but also one that when one employs common sense logic, the savings are not what one would think when it requires a 120 watt fixture to do the same job a high end LED could achieve at only 30 watts. Then throw in the lack of water proofing, use of a fan, & other issues that likely will occur once out of warranty and the savings go out the door. 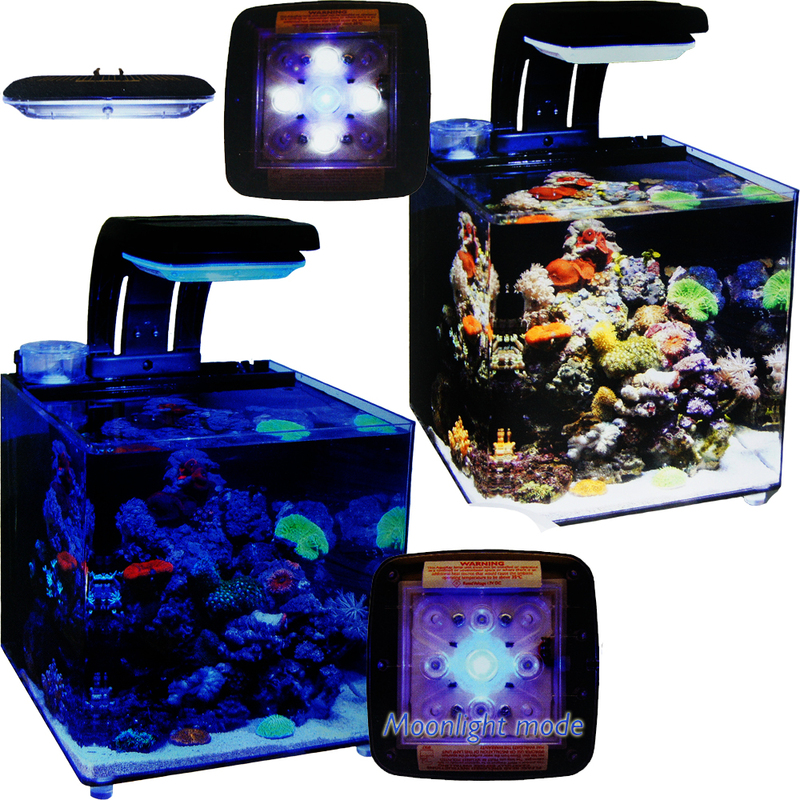 I will start with the newest and very well marketed offering, the SB Reef Light LED. What the SB Reef offers over the basic Black Box LED is more powerful binned Cree emitters, a larger heat sink and UVA. However, even on their own website, the USA distributor of this Chinese light is very vague as to real specifications. In reality their web site is all about marketing what “corals crave”, but little real information is provided. 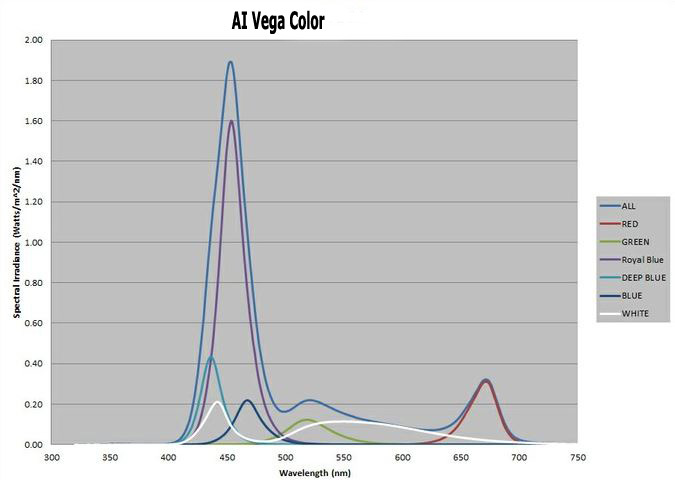 The picture above does clearly show that yellow/amber are used, which are VERY inefficient for photosynthetic light as per the current science of aquarium lighting. This makes their wave length graph highly suspect, since it shows no yellow light, yet they clearly utilize yellow/amber and cool white emitters!!! Basically this is nothing more than marketing, not science [as the efficiency numbers bear out]. What is also noteworthy is that while many LED lights are coming out with UVA emitters, these are for making our corals, etc. pop with color which is great, but there is little PUR energy with these, meaning wasted energy. More over, the larger heat sink is required due to the inefficiencies of this fixture both emitter and drivers (typical of the builder), as heat simply equals wasted energy. 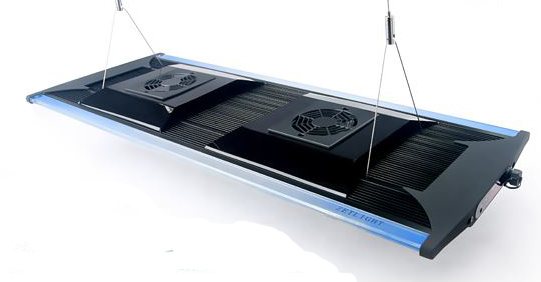 As well this black box LED fixture still depends heavily upon fans for cooling and it is not a matter of “if” a fan will fail, but “when” and the end result is over heating and total fixture failure (which has already been reported as per friends in the business and “Bulk Reef Supply”). Since these lights are overbuilt as per energy used and produced, these often well over produce heat that then needs to be dissipated, even when dimmed since these lights do not utilize PWM. The terrible efficiency of this over hyped LED shows up when we simply measure the wattage of input energy to product just one micro-mol of PAR. The SB Reef Light, while producing a spectacular PAR that is not even needed for most applications, requires .41 watt of input energy per mm of PAR generated. Even the economy Finnex is lower!! When dimmed, as most applications require, the lack of PWM means these lights use the same energy input for even less PAR! These are also not built to IP67 water resistance standards. While the price is good along with coloration, by the time one figures in that these are only about 1/4 the efficiency of better LED fixtures, any up front savings are out the window. Then, once build quality is factored in, including water resistance, these are NOT a good long term investment. The SB Reef Light is currently sold and serviced directly from China, but they are setting up a distribution point in the USA with a 2 year warranty. The Ocean Revive OR-D120 uses 120 watts to achieve the questionably similar PUR output to a high out 30 watts unit, which defeats the purpose of LED energy savings. As well these are another LED, which utilizes heat producing, energy wasting 0-10V current reduction technology rather than PWM technology, which is much more energy efficient. While one could argue the green emitters add nice colors, these are less useful lights when it comes to ESSENTIAL PUR. 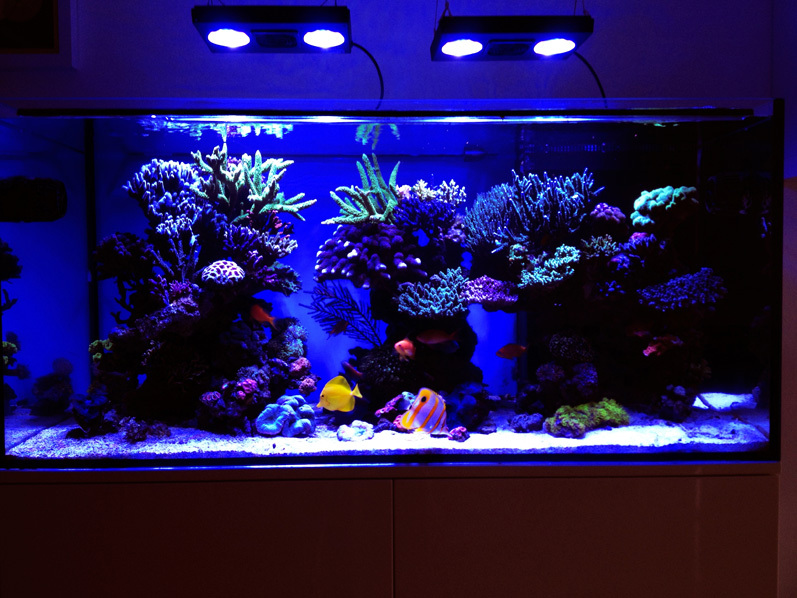 As well the use of warm while emitters is also very questionable, as no one would ever place neutral or especially a warm white fluorescent light over their reef aquarium, YET it is somehow OK for an LED? The cool white is also a questionable emitter. 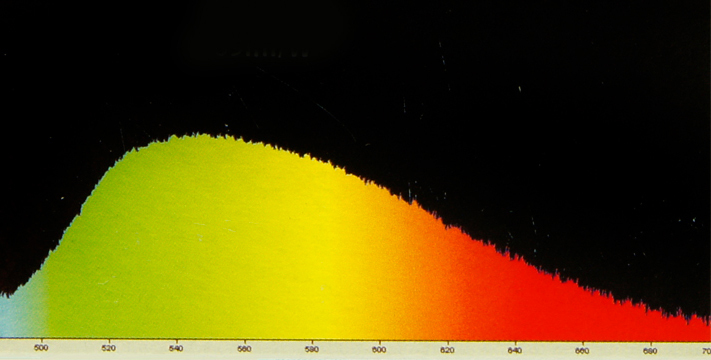 Here are a couple of Spectrograms, which further prove this point, as you can see most of the light energy is NOT within the important spikes required by photosynthetic life, rather mostly in the middle useless nanometer spectrums. The above said, this IS a reef capable LED light, just at a cost of much more electricity used (& higher carbon footprint), with a much lower PUR as per energy used than the MANY much better LEDs, as well as a much shorter fixture lifespan due to heat damage. But the color mix is nice and pleasing to some, especially those who place appearance over technology. 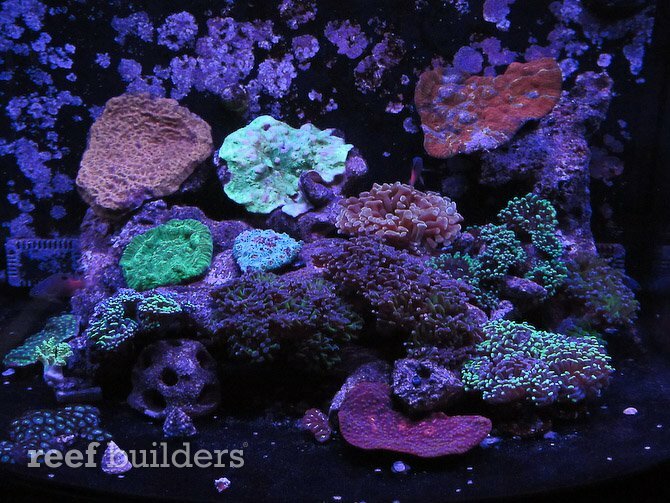 Some people will claim the addition of these color emitters are for coloration of the corals and prefer color over optimum growth of the specimen. This is a very nicely built LED with lots of interesting features, however when it gets down to the important PUR (Useful Light Energy) and warranty, this LED falls short. A video promoting this, which missed a key point in my experience/opinion, where he only used a PAR meter which does not show PUR, which is MOST important and requires a spectrograph to show more correctly. This video review did show the Radion can and DOES maintain corals, but it’s still using somewhat of the “shotgun approach” instead of a direct approach of specific LED emitters and use of PWM technology, which in the end requires about twice the wattage input for the same PUR results. 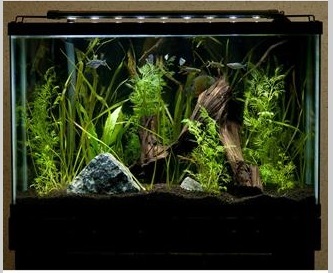 By “shotgun approach” I mean the common way in the past of lighting aquariums with multiple lamps using T8 or T12 bulbs to obtain the necessary light energy for photosynthetic life rather than specific light nanometers [this is not to say the EcoTech are even close to a T8 or T12 lamp, as they are vastly superior, this is only used as an analogy]. An example of what I mean, are the cool white and green emitters used, see below. This is certainly a nice mix of Blue emitters with both the XP and XT, albeit generic emitter bins from Cree. The Indigo and Ultraviolet emitters certainly add nicely to the blue mix. The mix of Blues is probably the best aspect of the EcoTech Radion, and why when compared to the AI Sol, I would pick the the EcoTech for any tank over 20 inches in depth when compared to the Aqua Illuminations. The use of cool white and green emitters is questionable as per references cited here and elsewhere in this article, as well as other researched articles. I also mildly question the use of Red emitters for Reef Lighting applications, since symbiotic photosynthetic zooanthellic have adapted over eons to the more blue environment of the oceans versus photosynthetic “higher” plants found in freshwater applications. From discussions with other reef keepers, they have not noted any improvement with added red lighting and in fact have anecdotally noted slower coral growth. The other misleading aspects are the completely useless RGB and capacitive touch ‘features’. 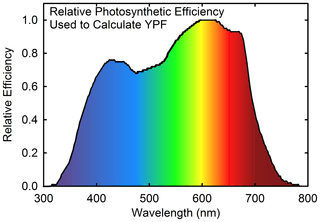 Controlling your RGB (Red, Green, Blue) of your light has little bearing on obtaining the exacting nanometer spikes necessary for photosynthetic life. There’s no known benefit from the RGB feature and in fact some reviews state this can be stressful/harmful to coral. 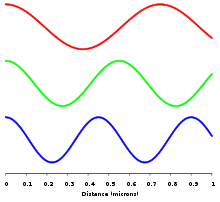 The reason is above spectrograph output only holds true when the emitters are run at the operating voltage and current that they were designed for unless PWM is employed. As soon as that simple voltage rheostat is used (“control technology”) or RGB is altered, the spectral output changes. As noted in other articles cited/referenced here, the emitter choice is just part of the LED equation, the use of “Current Reduction” instead of the vastly superior PWM technology is a major drawback of the EcoTech Radion. The evidence is the requirement of a cooling fan, which can break down from the heat produced. As well the placement of the fan tends to draw moisture into the fixture which is a complaint of many reef keeping professionals. One reason for the 1 year warranty offered by EcoTech in my opinion!. Further Reference: Radion XR30w Gen 2 Fan Failure. 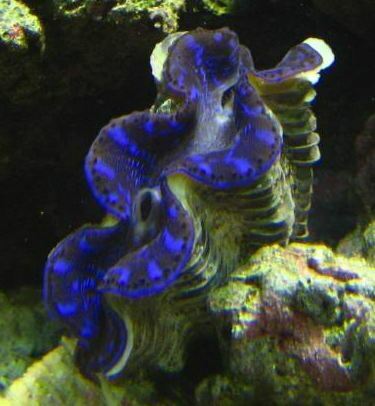 More importantly, the excess heat which requires a cooling fan also represents a considerable amount of lost input energy to heat that could be going to lighting your aquarium reef specimens. This is NOT an opinion either, as it is basic science that energy going to produce heat is energy NOT going to light! Another evidence is that the Radion Pro produces 1100 µMol•m²•sec PAR from 155 watts of input energy at 6 inches of air, but when compared to the before mentioned AquaRay Reef White 2000 NP Ultima, the AquaRay is rated at 380 µMol•m²•sec at 15 inches of air. Just assuming both were at 15 inches of air, so as to compare equally otherwise, when you multiply the 5 AquaRay 2000s at 30 input watts to equal the Radion Pro, you get 1900 µMol•m²•sec. So in other words (using these numbers), just in PAR, you only get half the output per wattage of energy used for the EcoTech when compared to the AquaRay LED. As well since we were comparing EcoTechs number at 6 inches, and AquRay at 15 inches, this also would increase the AquaRay numbers by even more. 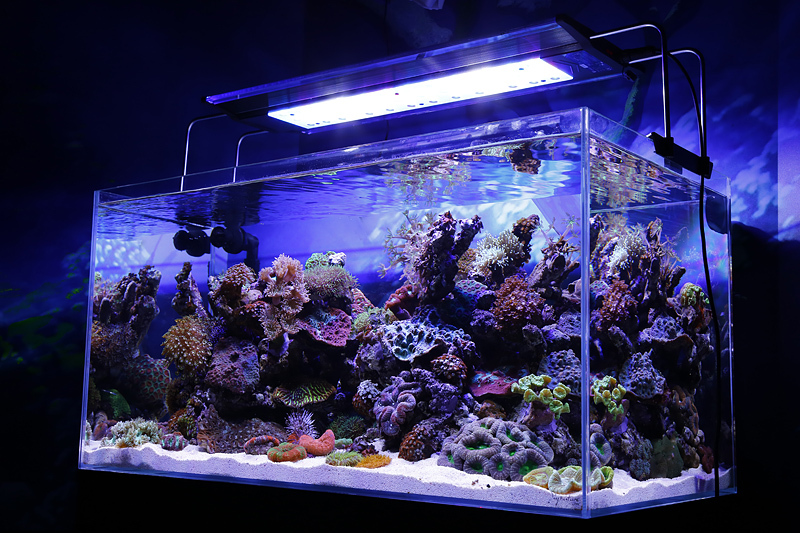 The end result is a fixture that may require about 1.5 watts per gallon to light an advanced reef tank compared to .8 watt for, as an example, the AquaRay Ultima. What I have noted from my own research and that of my aquarium design & maintenance friends is that the EcoTech Radion is well marketed to the point that many if not most forums and aquarium stores assume this is the best LED available when although excellent, it is not necessarily the best as per reasons and research cited here. Even EcoTech’s own customer service [according to a friend who forwarded me an email] will refer questions about their product to forums. So, all I ask is that one does there research, do not just take my word, as while these are certainly an excellent reef capable LED light, these are not necessarily the best. The bells and whistles also certainly may be what one buyer would desire, but another buyer might prefer an equally reef capable LED that is more efficient with less energy lost to heat or used as green light energy (that has no known PUR benefit). In fact as per electrical saving alone, this fixture will cost you $62 more per year based on running at 12 hours per day and with an average electrical cost of .13 per kWh. Factor in the one year warranty and lower lifespan (1 year warranty) and this can be a very expensive Reef Aquarium LED to purchase and keep over time!! Finally as per a comment asking me to back up my claims with data, while I cited references throughout this article, the above three, which includes my base article about LEDs, are also now added just above. As well as the Radions own data as per emitters used, simply reading the references and combining this with the Radions own published emitters pretty much backs up my statements, not to mention hands on use by others I know and the second reference above. TMC had a quality control failure in 2012 where-by these same cool white Cree emitters from EcoTech were used in their Ocean White 1500 XG fixtures instead of the correct patented XPG 9000-10000k emitters. What is interesting is this mistake was caught by knowledgeable customers, one of whom made a spectrograph so as to back up their claim that these were not the correct emitters. Why I find this interesting and why I post this in the review of the EcoTech LED is that those with reasonable knowledge of “Useful Light Energy” easily spotted this problem, yet based on friends in the retail industry and others will argue about CRee licensing while missing this very simple and basic problem with the LEDs using Cool White emitters. *Ecotech Marine’s Radion XR30 LED Light: a Swing and a Miss? The Kessil Reef & Planted Aquarium Capable LED light is popular among many deeper reef aquarium keepers. However marketing has driven many, including prominent YouTubers, to think these are better lights than they actually are. This is a very sleek and compact LED light, one of the better ones in my opinion. The Kessil LEDs also use patented emitters. 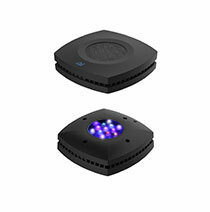 Kessil’s emitters are patented Dense Matrix LED™ technology which concentrates multiple LED chips into an array. The Kessil A360W (the ‘W’ is for wide angle) is their flagship as of the most recent revision of this article. Multiple Kessil A360Ws can be controlled with a single Apex Controller—two channels are required for each Kessil controlled. Future versions of the Apex Controller software will add functionality to the Kessil A360W. An example of this added functionality is a more gradual dimming and color shift. The A360W still has the two knobs, just like the A350W. But instead of one knob controlling the blue LEDs and the second knob controlling the white LEDs, one knob is used to control overall intensity and the other knob the blue/white LED spectrum mix. You can tune a preferred color within the spectral range thousands of research and testing hours determined to be the optimal spectral points. The A360W is a wide angle model has a beam spread of 70 degrees vertically (140 degrees edge-to-edge) and is recommended for larger tanks that are relatively shallow while the Kessil A160WE Coverage Area is up to 24″ surface diameter for fish-only/soft corals and up to 18″ surface diameter for mixed reef with LPS or SPS corals. The Kessil A360W is 90 Watts with an effective light greater than a 250 watt metal halide while the Kessil A160WE is 40 Watts. 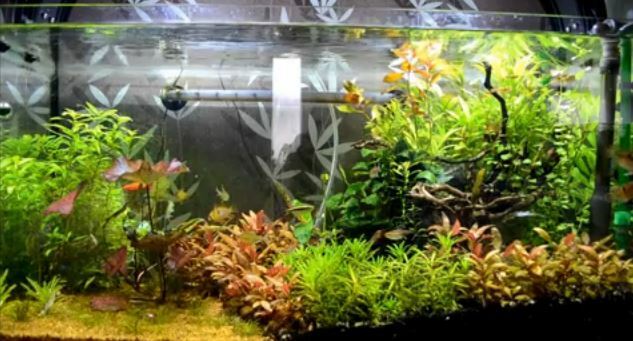 The adjustable feature that is cool to most aquarium keepers is also degrading to effective PUR, as while it is nice to have these features from our perspective, the simple fact is what you or I might like is not often what is the optimum PUR. As well, as with the AI and many other “tunable” LEDs, when adjusting your light spectrum, your LEDs full potential is wasted. 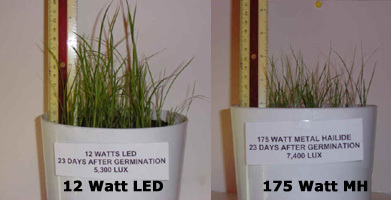 This results (as an example) in a 90 watt LED becoming 60 watt LED or less, so PAR output is also considerably degraded. In the end you are much better off with a proven fixed PUR spectrum set from the factory rather than a blend of “tunable” emitter colors. The amount of energy wasted as heat is still high due in part to its features such as use of tuning without PWM, hence the need for a cooling fan. 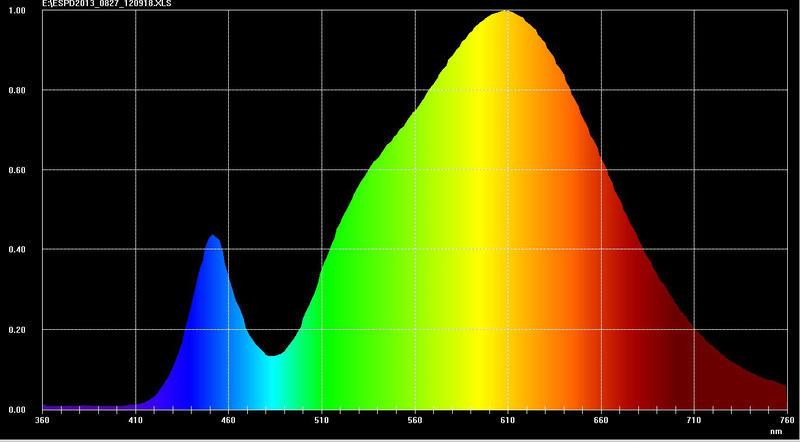 This is also why the Kessil A360W only replaces a 250 watt MH when higher PUR per watt, Other LEDs can accomplish this with half the wattage. Kessil refuses to publish any PAR readings which while PUR is certainly a a consideration, PAR is still the standard measurement to start with. As well, since we already know their spectral quality is suspect, it is difficult for Kessil to hang their hat on PUR to make up for poor PAR readings, especially outside the direct central of their lights. ACTUALLY PAR measure mostly inside the usable spectrum, it simply falls off toward the blue & red ends, meaning a PAR reading of a LED that is mostly blue that has everything else the same [including input wattage] is going to be lower. When we measure the Kessil A150 (90 Watt) which I have firm PAR readings directly under at 15 inches of air [not water which can throw some variables] we get 325 µMol•m²•sec. 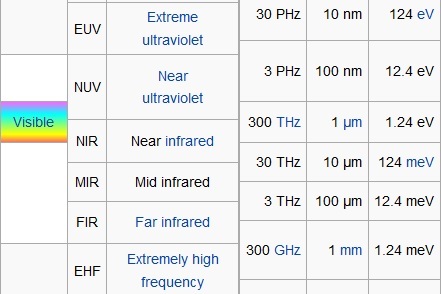 While this is certainly a good number as per raw PAR, but when we factor in that this is only directly under the light and this is at a full 90 watts of input energy, this is actually a very inefficient LED light as this is .28 watt of input energy per mm of PAR. By comparison the AAP/TMC Reef White 2000 has a PAR of 380 uEinsteins/sec/m2 @15 inches of air using ONE THIRD THE INPUT ENERGY [30 watts]. This is .08 watt of input energy per mm of PAR, TRIPLE THE PAR OUTPUT PER WATT! This does not even factor in the better spectral quality, making the Kessil a very suspect aquarium LED for the price paid IMHO! In my opinion, it is unfortunate that so many planted and reef keeping gurus hang their hats on these good, but far from the best LEDs. The only logic I can see outside of brilliant marketing is the sleek looks. E.Shine is a large producer of LED Fixtures, which are probably among the nicer design and generally better quality LEDs coming out of China. E.Shine often does not sell directly under their name, rather they market to retailers and distributors for their own branding. Stark LED (distributed by Sea Dwelling Creatures of LA) is probably the most common marketer of this LED Fixture. While E-Shine has updated their emitter bins, they remain behind the industry leaders as E.Shine utilizes common “binned” Cree & Bridgelux emitters, often a generation or two back at that. 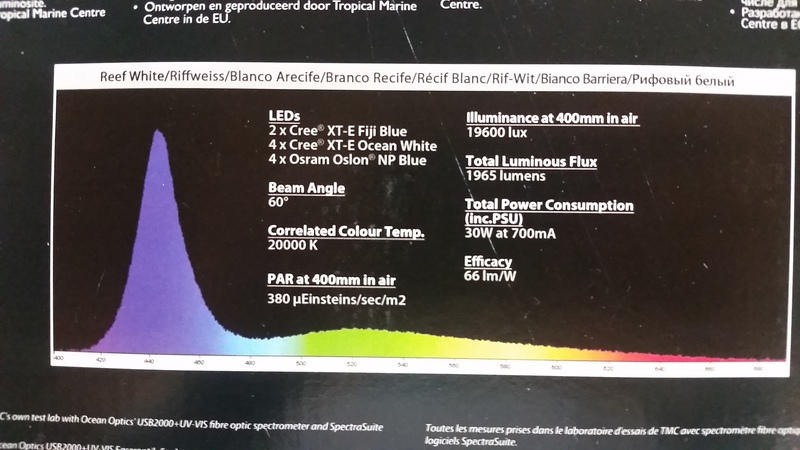 In fact even E.Shine’s own web site admits that the older generation 3 watt CREE XG used for their COOL WHITE Daylight Aquarium LED Lights vary from 8000~10,000K; not the exacting emitters used by high end LED fixtures that target specific nanometer wavelengths for the best PUR. Reference: e-Shine 60 Watt Cree Classic LED. Please note that these are cool white emitters. Would you go to the hardware store and place a cool white lamp over your reef tank? These emitters used by E.shine do NOT maintain the peak PUR necessary for delicate marine life, and instead have much more wasted yellow and green wavelengths due to use of cool white and green emitters. It is also noteworthy that ALL E.Shine LEDs require a fan, some more than one at that. A proper driver along with PWM does not require a fan due to better control of voltage between the emitters, notwithstanding, spikes in voltage which decay PUR show up as excess heat!! E.Shine does a great job “pushing” these LEDs on companies looking to sell a nice looking product at a VERY good mark up, as I know of a friend in the business that gets these LEDs constantly marketed to him at prices that would allow for much better margins (since the emitters are low cost generic Cree emitters). However he has rejected these out of integrity to sell the best generation LEDs, even if the profit margins are lower. One plus is E-Shine has increased their warranty to 3 years for most fixtures. From input of those using these products longer term, e-Shine has basically used the same design and technology, keeping development costs down while also improving quality control, thus the better warranty. In the end with eShine, you get a very energy wasting, but still reef capable LED of older technologies, and with a good price and good warranty. There are many other LED lights coming fast onto the market, occasionally excellent, many good, many not so good, some a downright rip-off! 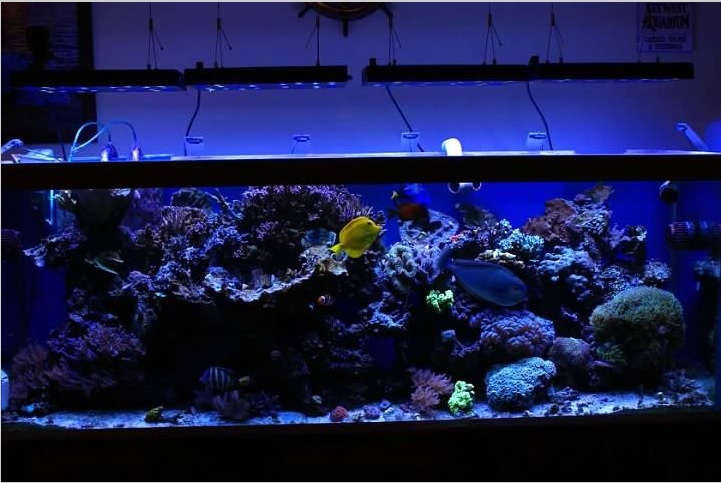 Knowing about what makes for correct Aquarium Lighting is quite helpful in making an informed decision. 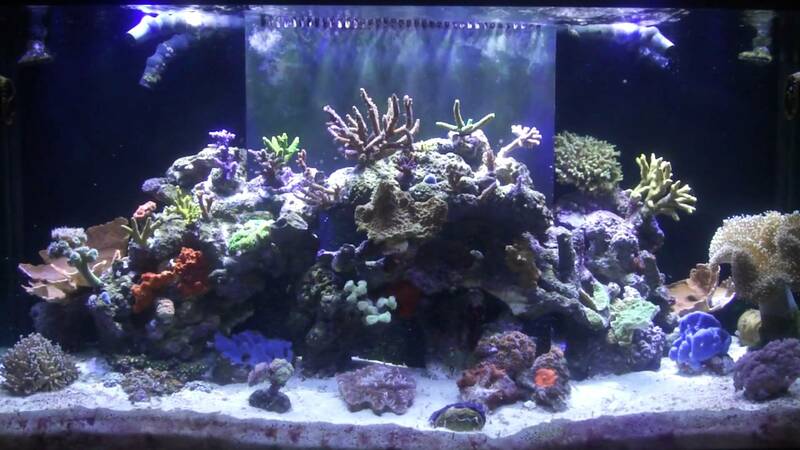 I would also stress that even among the more effective new LEDs hitting the market, such as the BoostLED, these all have to compensate for inferior emitters with high amounts of wattage used, which in my humble opinion defeats a primary reason to use quality LED lighting for your Reef or planted freshwater aquarium; lower electrical consumption per output of useful light energy!. Using 4.5 times the energy (wattage) to produce only 30% more PAR, as in the BoostLED versus other tech, makes little sense to me or most aquarium professionals I have spoken with seeking the best lighting for their clients. This “shotgun” approach to aquarium lighting defeats the reasons to use LED lights [energy savings], one might as well use a good 150 Watt Metal Halide rather than a 135 Watt LED. 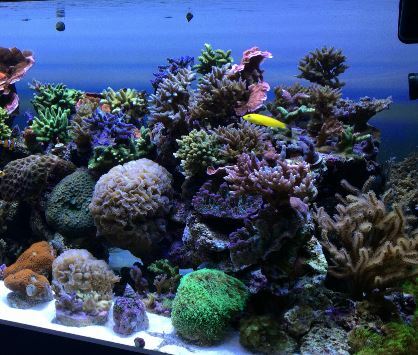 A Few decades ago, the “shotgun approach” is all many aquarium keepers of high light planted or basic reef tanks had as per comments by a 35 plus year aquarium professional I interviewed. So using eight 48 inch 40 watt “cool white” T12 lights to light one 60 gallon aquarium was sometimes necessary, but this is not necessary with many modern lights, so why go backwards when the technology is here? For an example of a newer “excellent” LED Aquarium Light is the “Orphek Nilus Reef Aquarium LED Light” which is equal to a 250w-400w MH/HPS light. The Orphek Nilus 120 watt LED light contains 60 LEDs in 90 degree lenses running at 2 watts each within a 24″x 6″ x 2″ housing. This LED has (4) innovative “True Violet” 380nm – 420nm emitters (excellent for 30″ + tanks) as well as (4) 640 nm red emitters (which are nice for coral color aesthetics, but little to no effective PUR use in tanks over 18 inches of depth). This LED is quite expensive (over $800), however it is designed for tanks over 30 inches in depth [replacing Metal Halides]. The overall color temperature is about 16,000k. 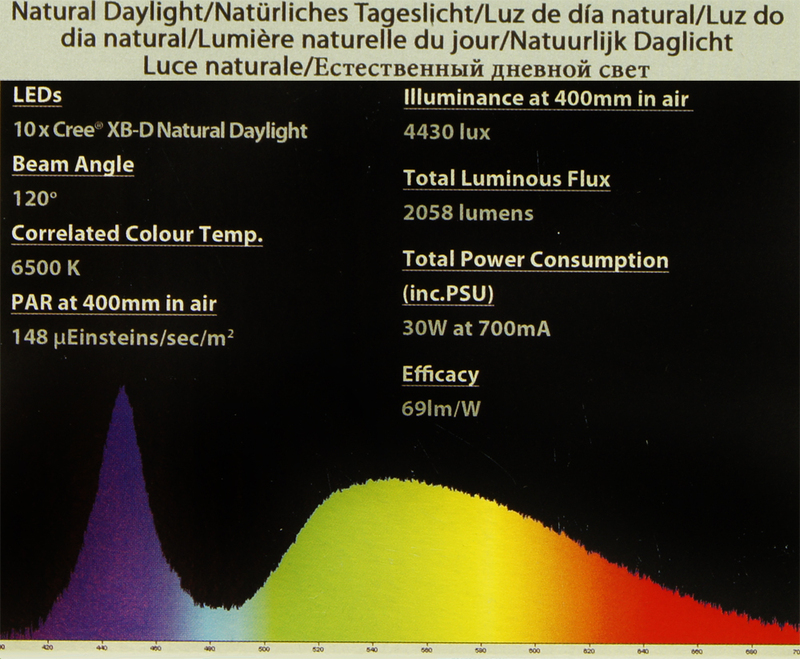 The spectral range is greater than the common Cree or Luxeon LEDs used in many LED fixtures, starting at just around 400nm (violet) and spanning all of the way to 750nm. 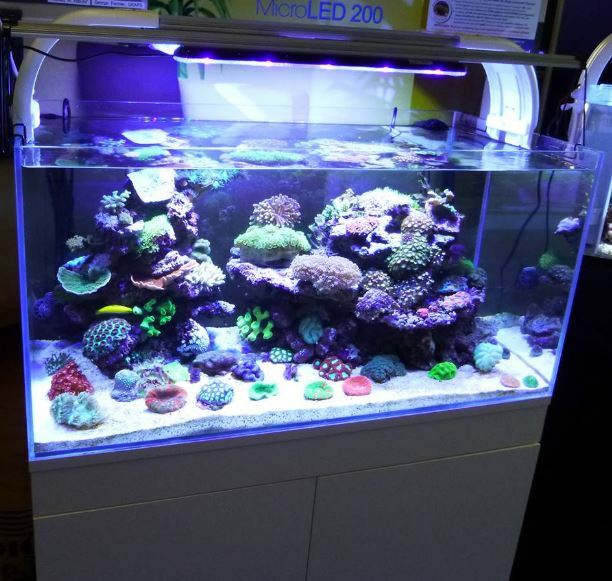 This is a top notch LED Aquarium Light for deep reef tanks, however I do not agree with a couple aspects of this design of this light and that is its emphasis on CRI (Color Rendering Index), as this is more important to what we see and not what the symbiotic zooanthellic algae within corals actually require. As well the Orphek white emitters are 12000K to 25000k leaving out much of the essential near infrared. 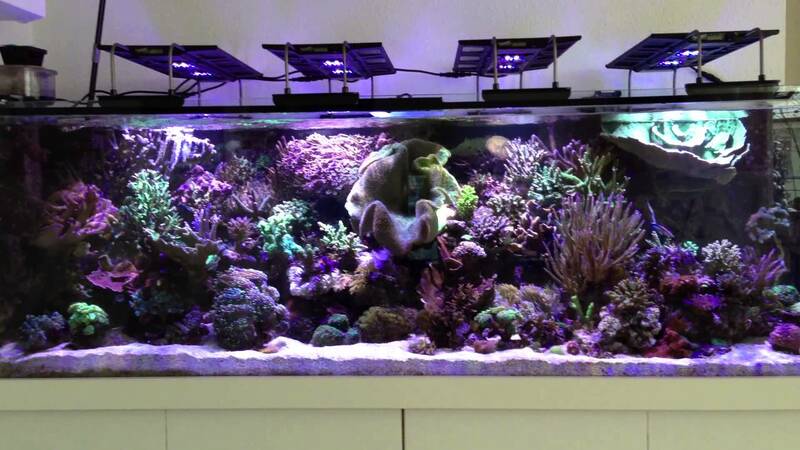 While I realize that the popular fad of fading/dimming LEDs for sunrise/sunset is simply that; a fad as there is no scientific basis that this aids corals, I also do not agree with Orphek’s use of “blue” lights for moon light phase, which is also just a fad with no scientific basis in fact. Emitter bins used in LED Lights are improving rapidly, although I am sure at some point these will hit the technology ceiling. In the mean time, one can be certain of one thing, the best emitters are going to be licensed/patented and one is not going to find these in many of the cheapie knock offs. Even many of the “better” LEDs may use the newest emitter bins, but these are still “over the counter” emitter bins meant for many uses, not necessarily aquarium lighting and these bins generally aimed at higher CRI rather than the much more important PUR. Another issue is that some companies are practicing patent infringement to close this technology gap. Purchasing these LED Aquarium Lights is not only a moral decision, but also many of these “stolen technology” LEDs are cheaply made and once these LEDs are legally closed down, the person who did not care about the moral issue, will likely face the problem of a light that fails to work long term with no customer support. This will result in these knock off LEDs being useless and not the bargain one might think when purchasing. 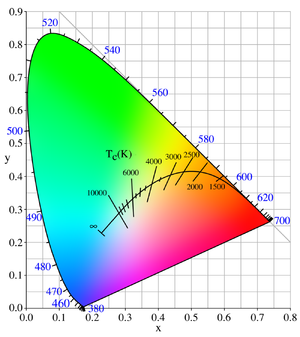 Finally, also realize the most important light measurement is “Useful Light Energy” or PUR and although I recommend the use of PAR Meters as a measurement of any aquarium lighting fixture, in the end this FAR from 100% accurate, especially when one considers the emitter bins used, and useless PUR emitter colors such as green. 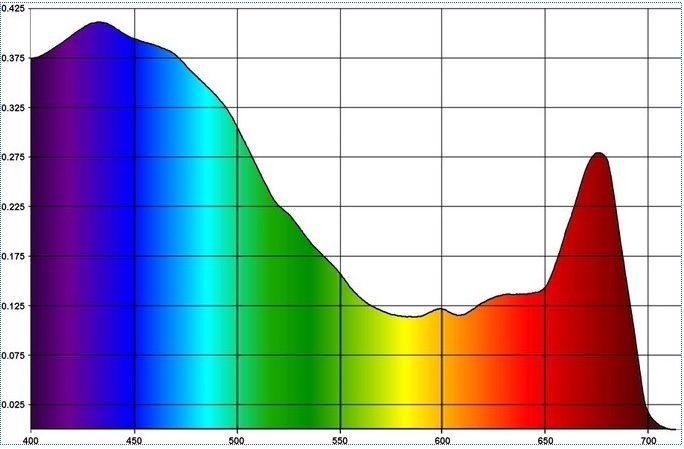 Often the “cheap” LEDs produce considerably more useless green/yellow light and are bottom heavy in the Blue Spectrum. 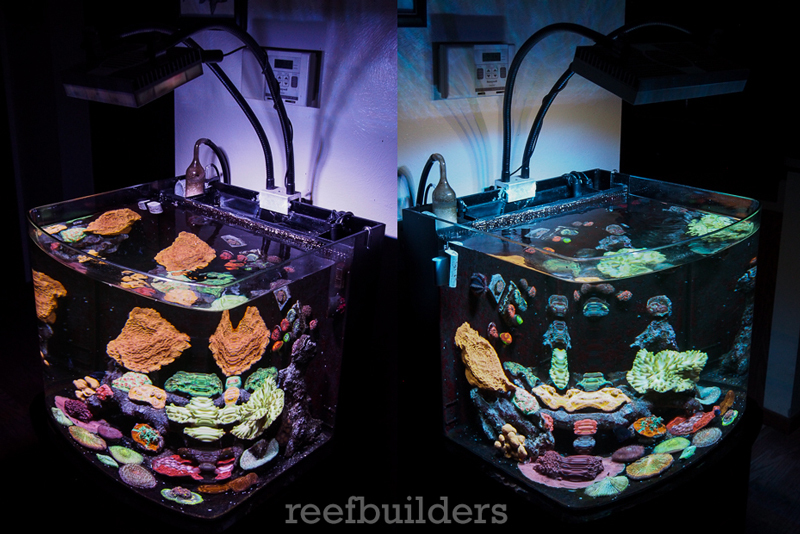 So, consider whether your so-called “deal” of a LED Light is really a deal at all or look at it this way: would you use multiple LED Flashlights you can purchase at Walmart to light your Reef or planted Aquarium? Although this analogy is a bit exaggerated, it is still a reasonable analogy when one considers current technology advances and the costs of developing these advances.